Proper cleaning of an Oriental rug is a much more involved and precise process than you may think. 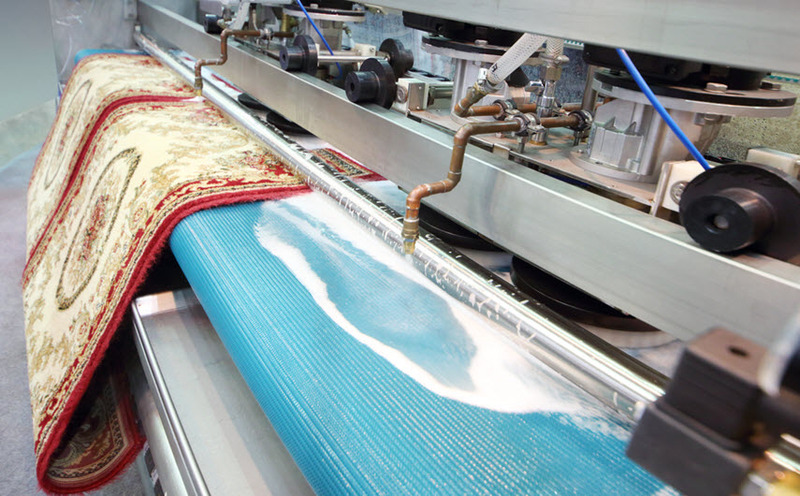 Whether your rug is made by hand or has been machine-loomed, the natural fibers in the rug will demand that care is taken when a cleaning is required. For those who own antique rugs, the need for expert treatment is even more important; very old rugs often have fibers that were dyed using natural vegetable dyes, which can be very susceptible to damage should the wrong cleaning treatment be used. Better quality Oriental rugs are always made of wool or silk, with a backing of cotton. These natural fibers, while resilient and strong in their way, also require that special care is taken during cleaning. Fortunately, our highly trained technicians, specially designed cleaning agents, and modern equipment will guarantee that your rug will be cleaned completely and thoroughly without sustaining any damage. Undoubtedly, you have been vacuuming your rug regularly, and although this helps to remove dirt from the surface, it will not to anything to get rid of dirt that has accumulated down at the rug’s backing. Airborne dust, as well as dirt that is tracked in on shoes and paws will affect your rug negatively. You may not see this dirt, but it is there to constantly eat away at your rug’s fibers. It takes a professional cleaning, such as we offer at Smart Choice Oriental Rug Care, to really clean your rug safely and completely. To make certain that your Oriental rug is cleaned as completely and safely as possible, we follow a number of steps before, during, and after your rug has been cleaned. The existing condition of your rug must be determined before we begin our cleaning process. This will assure that the treatment will not cause any harm to the pile or backing. Any existing damage to the rug will affect how we proceed. A complete inspection is performed before any work is done. Our technicians will measure, inspect, and make note of any problems that are apparent, such as stains, tears, or worn spots. A determination of fiber is done and a test is conducted to find out how colorfast the dyes used in the rug are. The colorfastness of the dyes will determine exactly which cleaning agents will be used. The inspection also includes a test of the rug’s pH; whether the fibers are neutral, acidic, or alkaline – this will also factor in concerning the solutions we will incorporate while cleaning the rug. Note will be made of any obvious stains as well. It is absolutely impossible for your vacuum to really remove ground in dirt and dust from your rug. Fortunately, we have dust removal equipment that does a terrific job in getting out dust, pet dander, and dirt that you simply cannot reach with ordinary means. Fine particles insinuate themselves not only into the backing of the rug, but right into the fibers themselves. A rug can actually hold several pounds of ‘invisible’ grime that will not only dull the appearance of the rug, but cause health problems to you and damage to the rug as well. Our special machinery will be able to remove this hidden grime safely and completely so that this hidden dirt does not simply get washed back into the rug when the actual cleaning is being performed. Our inspection will not only find any stains present (some may have faded so that you are unaware of them), but also what has caused the stain. Coffee stains may have to be treated differently than stains caused by a spill of red wine. Some of the most difficult stains to remove are those caused by pet urine, feces, or vomit. In the case of the latter, a pretreating solution that contains enzymes will be used to break down the organic residue and urine salts. Remember, too, that if pets smell old urine on your rug, they will be more likely to use that spot again for elimination. Due to the delicate nature of Oriental rugs made from natural fibers such as wool or silk, we take a different approach to their cleaning than would be used for carpets. In order to provide the best, safest, and most thorough cleaning for your Oriental rug, we will now immerse it into a shallow tub of cool water and use a cleaning solution that will be perfect for the fiber and dyes used in your rug. At this point, we use a hand brush to assure that the now dust-free and pretreated rug is scrubbed gently. This process assures that not only will your rug be completely cleaned, but that no damage will be done to the delicate natural wool and silk fibers, and that colors will not fade. After the rug has been cleaned completely, the cleaning solution must be rinsed off and the excess water extracted. Your Oriental rug will be removed from its bath and a hose will be used to flush the cleaning agent and loosened dirt away. We will continue to rinse your rug until the water runs clear, Smart Choice Rug Care will use an extractor to remove as much water as possible from the rug. This process not only speeds the drying process, but it also helps to ‘fluff up’ the fibers and return the pile to its original condition. It is important for your rug to be dried off as quickly and safely as possible to prevent the formation of mold or mildew. Smart Choice Rug Care takes two approaches to drying your rug, and this will depend upon the age of your rug and its general condition. Most Oriental rugs will be hung up on special racks to dry. This allows for an excellent air flow, and we also use fans to hasten the drying process. Alternatively, we will place your rug on a drying rack, once again using air movers. We avoid using heated air as this can cause your rug to shrink or warp. Dehumidifiers are also used to help your rug dry as quickly and safely as possible. When your Oriental rug has dried completely, we will inspect it to make sure that all dirt and stains have been removed. During the inspection we will check the condition of the fringe, bindings, and backing to make sure that they have come through the cleaning process intact. A special meter will be used to make sure that your rug is 100% dry, and we check every part of the rug: pile, fringe, backing, and bindings. As soon as we have become certain that your rug is ready, we roll it up, place it in a plastic bag along with all relevant documentation, seal the bag, and return your rug to you. You will undoubtedly be thrilled at the bright and beautiful appearance of your Oriental rug when we return it to you, and will be anxious to keep your rug looking good as long as possible. Smart Choice Rug Care offers a conditioning and protection option that will help to maintain the appearance of your newly-cleaned rug for a much longer period of time. Keeping your rug looking great between scheduled cleaning at Smart Choice Rug Care will be much easier if your rug receives our conditioning treatment. After the usual drying step above, we apply a conditioning solution to the rug, to be gently worked into the pile. This will make the fibers softer, yet stronger, and the protective agents in the conditioner will help to resist future dirt and stains. In order to assure that absolutely no traces of urine or pathogens are still present, we use a special Xenon light to detect these, and will deal with them promptly if there are. Once again, as soon as the rug is completely dried, it will be placed into a plastic bag and returned to your home.